Rock crawling is an extreme form of off road driving using vehicles anywhere from stock to highly modified to overcome obstacles. 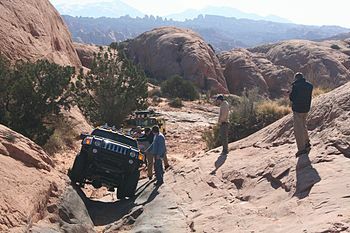 In rock crawling, drivers drive highly modified four-wheel-drive vehicles such as trucks, Jeeps, and "buggies" over very harsh terrain. Driving locations include boulders, mountain foothills, rock piles, mountain trails, etc. Rock crawling is about slow-speed, careful and precise driving, and high torque generated through large gear reductions in the vehicles drivetrain. Rock crawlers often drive up, down and across obstacles that would appear impassable. Rock crawling competitions range from local events to national series. These consist of 100-200 yard long courses with obstacles set up with gates, similar to a slalom ski race. Oversized, low-pressure, knobby, mud-terrain tires are used. Most vehicles have a low-geared transfer case to make the most torque in the low speeds used for rock crawling. Suspension-wise, rock crawling vehicles sometimes have after-market lift kits installed, raising the chassis and increasing suspension flex, though the rock crawlers running the tougher trails often have fabricated suspension systems, or home-assembled leaf packs to cheaply achieve the goals, making it easier to drive over larger obstacles with less risk of damage to the vehicle. Most suspensions are made to be highly flexible, allowing for the maximum amount of tire area to contact the ground, while keeping the vehicle as low as possible. Due to the conflicting nature of the dynamics and needs of rock crawling and highway driving vehicles, it is not unusual to modify a vehicle solely for off-road recreational usage. Once a vehicle is deemed "off-road only" i.e. not driven on the street and trailered to trails or OHV parks (Off-Highway Vehicle), then the modification possibilities are endless. Those with the financial resources can build their own rock crawler. The biggest benefit of this approach is that the owner has complete control over what their vehicle is capable of, since each part of the vehicle can be custom designed. Acquiring sponsors can help to cover some of these costs. Wikimedia Commons has media related to Rock crawling. This page was last edited on 20 March 2019, at 16:18 (UTC).